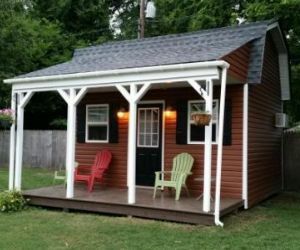 Build a Small Cabin or Tiny House! 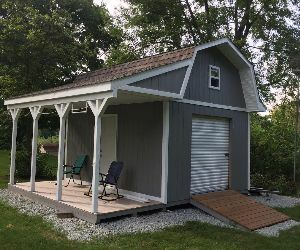 You can use these 12x16 barn with porch shed plans to build a work space such as a home office, storage shed, shed home, tiny house, small cabin or cottage, music studio and more! 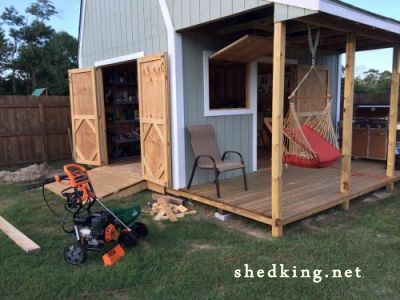 The plans are easy to use, easy to understand and come with a 3d interactive pdf file, and links to download the building guide, materials list, and you also get email support for any questions you might have about building this neat shed. 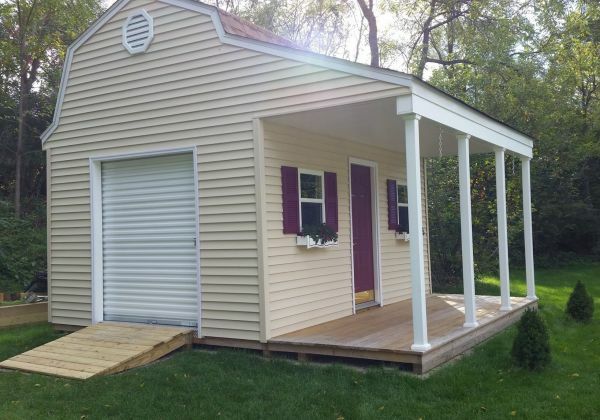 This barn has a 6' wide by 16' long porch that you can use for any number of purposes like storing firewood or just setting up a few chairs and lounging and taking it easy. Porch construction is easily built on the opposite side if you prefer. 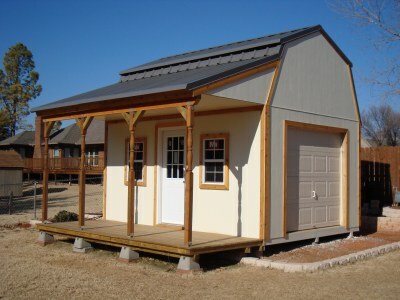 You have the option of going with a nice 6' roll up shed door or building a set of double shed doors instead. 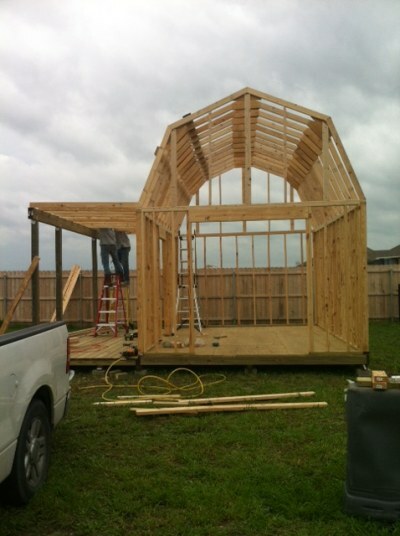 The side with the porch on it has an entry door that is about 36" wide but can be framed to your specs. Plans also come with instructions on how to do framing for adding windows wherever you might want some extra light coming in. I have even included plans for adding a nice loft for all that extra storage you may need up in the ceiling area which is very roomy indeed with a loft floor to ceiling height over 5.5'. And this loft can be expanded to whatever length you need. 8' is shown in the plans. 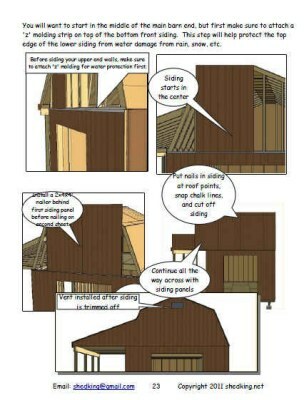 On the first page of your plan download there are links to download the construction guide and materials list. The materials list shows both quantities for each building phase and totals for shopping at your favorite lumber supplier. Download the materials list. 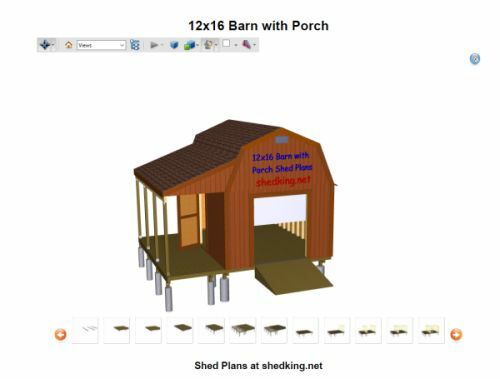 You can buy these 12x16 barn shed with porch plans by clicking on the Buy Now button below. They are immediately downloadable now for just $16.95. Payment processing is handled by paypal and ejunkie. You do not need a paypal account to purchase using this payment method. If you encounter any problems at all please email me at shedking@gmail.com. To view the 3d interactive plans you should have the latest version of your pdf reader from adobe. More shed plans from shedking.